PETERSBURG, FL – C. Bette Wimbish experienced many first in her 85 years on this earth. She was the first African American to hold modern elected office in the Tampa Bay area, the first Black female lawyer in Pinellas County, third in the state of Florida, and the first Black vice mayor for the City of St. Petersburg. Therefore, it only seemed natural for Senator Darryl Rouson to champion the renaming of I-375 to the C. Bette Wimbish Highway. The highway is a portion of I-75 and runs north of Tropicana Field and ends down by the Coliseum. The city council passed the renaming unanimously on July 13, adopting the state law that came into effect July 1 when Gov. Rick Scott signed the transportation package. The Pinellas County Commission gave the go ahead July 18. Rouson said he stopped counting at 17 when naming buildings in St. Petersburg named after African-American men such as the Morris Milton post office, John Hopkins Middle School, George Perkins Elementary School and Douglas Jamerson and James Sanderlin both have two buildings named in their honor. When it came to honoring African American women, only three names came to mind: Johnnie Ruth Clarke, Olive B. McLin and Fannye Ayer Ponder. “I started to think what African American woman has made significant contributions to the city and to the state that people will probably agree on and not be controversial, and her name popped to mind,” said Rouson. Mrs. Wimbish, née Davis, was born in Perry in 1924. She was a very intelligent and athletic student who matriculated into Florida Agricultural and Mechanical College for Negroes (now Florida A&M) at age 16 after being denied admission into Stetson College because of her race. While in FAMU, she met her future husband and aspiring physician Ralph Wimbish. The two were wed in 1945 and moved St. Pete in 1953 after their Tampa home they built in a white neighborhood was burned down the night before they were to move in. Dr. Wimbish set up a medical office on 16th Street, and in 1965 Mrs. Wimbish enrolled in law school at FAMU with her children in tow. Two weeks before graduation, her husband died of a heart attack at 45. A week later, Mrs. Wimbish returned to law school and passed her exams. She turned her late husband’s medical office into a law office and began her career in law. Together, the Wimbishs were a power couple. She was by his side when Dr. Wimbish took on Major League Baseball for hotel discrimination. The two, along with other community leaders, opened their home to lodge players during spring training because Jim Crow laws prohibited black players from staying in hotels with the rest of the team. In a St. Petersburg Times editorial written by their son, Ralph Wimbish, Jr., he mentions how his mother was always on the front lines next to his father. In 1969, she won the city council seat, but racism made the job frustrating. Just about every initiative she made was blocked. Finally, in 1971 new blood entered the council and she was made vice mayor. In 1973, Mrs. Wimbish was appointed the deputy secretary of commerce by then Gov. Reubin Askew, where she became the second-highest ranking woman in Florida government. 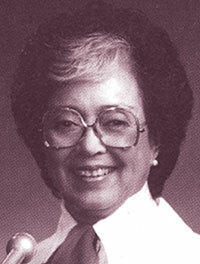 Before retiring in 2003, she was the local counsel for the Florida Department of Social Services. “She served not only her community, she served her city and she served her state,” said Rouson. Mrs. Wimbish died in 2009 at the age of 85.